Artist and wood carving instructor Coleen Curley of Pittsfield finds inspiration for her carvings in the small details of everyday life — a childhood toy or a curve of tree bark. Jess Gamari talked with Curley and wrote this story for the BTW Holiday Guide 2015. Before wood carving, Curley embroidered cross stitch shirts and sweatshirts for commission. She welcomed custom orders, she said, but customers often preferred to order the standard colors and design. “I really liked the design, but making 30 of the same ducks in a row was monotonous,” she said. With wood carving, no two pieces are ever truly alike, and that uniqueness drew her in. Curley is one of the many artists participating in the Berkshire Museum Festival of Trees 2015, the museum’s annual holiday show. This year some 100 holiday trees echo the themes of two winter exhibits on the American West. In keeping with the theme, Curley has created several Western ornaments and wood sculptures. Instead of the rugged look, her cowboys shine. In past years, she has created wizards, dragons, leprechauns, witches and animals, and many variations of Santa Claus sparked by different time periods, different cultures and different body types. “I’ve been very inspired by the 1940s Santa for many of my ornaments,” she said. She has created Santa ornaments with icicle bodies and Christmas tree bodies, and some of her Santas wear purple or gold hats depending on her vision. While some artists like Curley can see a vision and tackle a piece head on, other artists prefer to sketch ideas on paper or on their piece. As a teacher for a wood carving class, Curley has found different ways to teach students who learn differently. When students need more guidance on their sculpture, Curley says she doesn’t like to make carvings on their work. She enjoys working with small groups of adults so she can help those who need it, she said. Classmates have become close friends who work together. “We were talking about it the other day, and we didn’t realize we had all been meeting together for 18 years,” she said. Students use the ideas as a starting point, but Curley encourages students to change whatever they like and to incorporate personal touches into their pieces. For example, Curley had the students carve their pets into one of the Santa figure projects. In another project, Curley suggested the students carve their favorite childhood toys into Santa’s bag. “It’s fun to see what each student wants to do, and then they say, ‘okay, how do I do this?’” she said. “A lot have their own ideas, they just need help on getting it out of the wood. Each student has their own tools and sharpens them, and Curley provides the blanks used for each project. 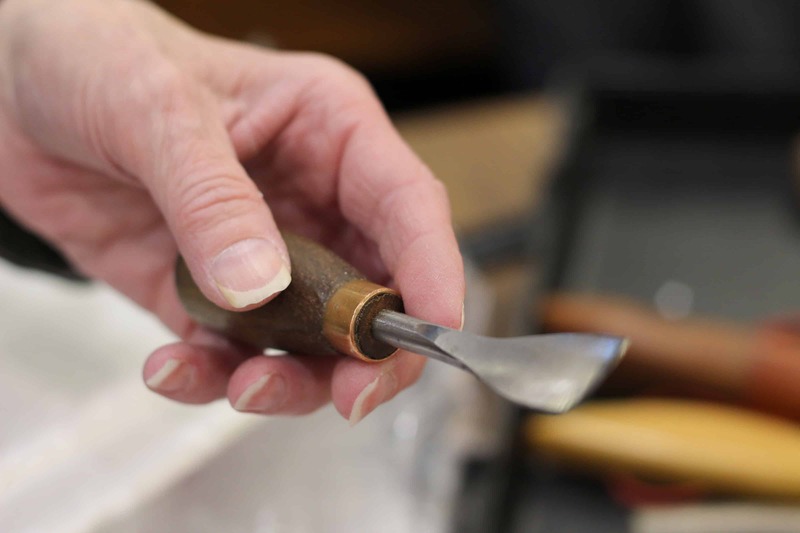 While she and many professional wood carvers use a standard set of Swiss carving tools, she said she also still uses the first set of carving tools she bought at a seminar many years ago. She tells her students to choose something that feels comfortable to work with. “The tool is an extension of the hand, and the better you feel, the better and longer you carve,” she said. She is a left-handed carver and has developed arthritis, but she has found tools which are comfortable for her to use. The class typically works with basswood, although once they created gnome houses out of curvy tree bark. Her favorite moments are seeing the adults get as excited as children over something they created with their hands. Though the class has met together for 18 years, Curley believes there’s always more to learn. Over the years she has had students with different art backgrounds give insight into alternative methods, like clay sculpting and flat wood painting. 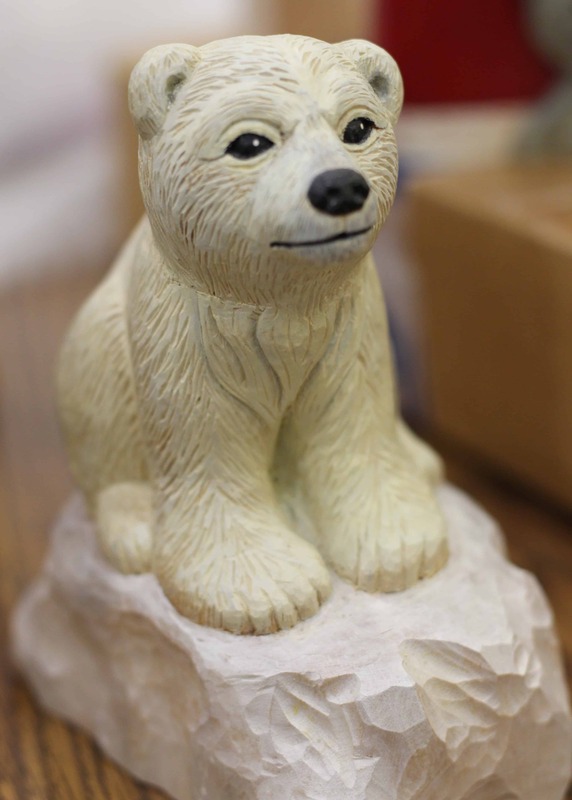 Even when students make mistakes in cutting the shape of the sculptures, Curley said there is “always another face underneath.” She recalled having a student who said he was carving a different animal each week, going from a wolf to a cat to a polar bear. Jess Gamari is a freelance writer and photographer living in Adams, Mass., and all of the photographs in this story are hers. She worked with me as an intern at Berkshires Week & Shires of Vermont and went on to write freelance stories and take photographs reularly for the magazine, among her many activities and enthusiasms.